is now in planing stage, and will be showing a pilot demonstration by 2020 . It is expected that the plan will be ready to build around 2035. 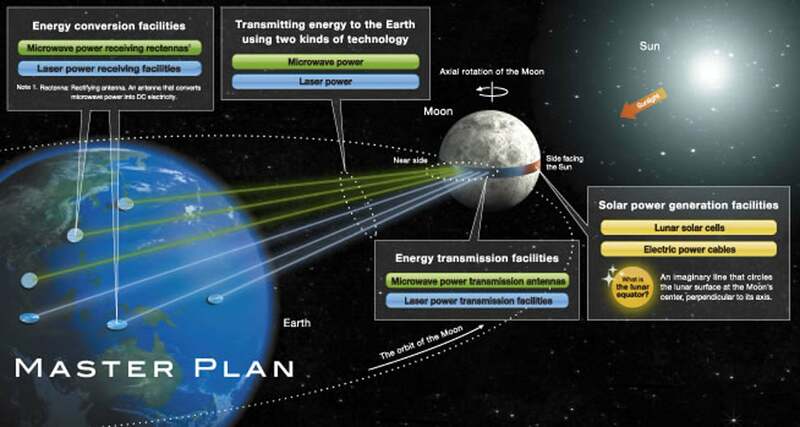 The solar station on the moon would be made of solar pannels and is expected to create an amount of 13 000 TeraWatts of energy, and would collect and store the energy and beam it unto Earth using laser technology as well as micro-waves. The Sizewell B nuclear reactor in Suffolk produces 1,198 megawatts (MW). The conversion to electricity happens once the energy reached the reception station on Planet Earth, and integrated into the grid to be utilized. The collossal amounts of renewable energy this solar station could produce would resolve a big part of the energy challenge that many governments are facing on this planet, as well as reduce a considerable part of Carbon Emissions. Why the moon? Because Its equator is a place that is constantly exposed to big quantities of sunlight , in a continuous steady matter, and without interruptions due to weather problems like It is the case on Earth. According to a few, this could be indeed a long term solution on a big scale for the Earth’s ever-growing poupulation and energy needs. In fact, a few other agencies and research centers have been on the possibility of solar stations on the moon , agencies like NASA, xhich had a particular interest on the topic. On this topic of a solar base in the moon, theories and innovative ideas have been numerous. We cite the idea of Lewis-Weber, who published a paper in the journal New Space with what he thinks could be the solution to the upcoming energy crisis: putting self-replicating solar panels in space. These solar panels would to build copies of themselves, autonomously, on the surface of the moon. Then they would enter Earth’s orbit, collect the sun’s energy, and wirelessly beam it to the ground. Lewis-Weber’s paper builds on the work of John C. Mankins from Artemis Innovation Management Solutions. His solution is to build self cloning robots , that would make the difficult task of sending thousands and thousands of them to outerspace unecessary. The solar panel would then be growing and self replicating exponentially. Lewis- Weber said: ”Earth orbit doesn’t have a whole lot of resources for building all those robots, so instead we could send the self-replicating machine to the moon, Lewis-Weber suggests. There, it could mine the soft lunar regolith for aluminum, iron, and silicon, to turn into parts for its solar satellite babies. Still overly expensive, this solution may not be the most practical at the moment, however its efficiency is definetly the best in all options available , due to a more stabile solar exposure in the moon, and the long term infinite potential of generating colossal amounts of solar energy for planet Earth.